I was super excited to learn this was finally coming to Blu-ray. This is a very underrated and underappreciated film. Thankfully Twilight Time Blu-ray saw the beauty of this important piece of cinema. They lovingly bring it out on their Special Edition 3,000 Unit production Blu-rays. They have mastered yet again another amazing product. This stars one of the greatest living actors, Christopher Walken, and also the amazing Sean Penn. This is a gritty crime thriller. A great acted trip into the world of the criminal nature. Guns and crime, and most of all, a sense of drama. Two brothers, a horrible father and the nature of being bad, come full force, for the viewer watching. The cast is thick and the performances are something to remember. This is based on a true story. The setting starts out in 1978. Brad (Sean Penn) and Tommy (Christopher Penn) are two young brothers with no real direction in life, imprisoned in a local small country setting, and wanting to escape. Drinking, drugs, no rules, and no purpose, leads down one bad path, after another. One day their missing father, Brad Sr. (Christopher Walken), who they have never met, ends up showing up, out of the blue. Soon Brad and father are hanging out. Daddy is a criminal, a thief, and Brad, seeking a father and wishing for more, and most of all, a way out of his small life, gets pulled into his father's lifestyle. You can’t help but feel sorry for Brad and Tommy lost in this town. The acting by Sean Penn and Walken is stunning. I love seeing the young cast in this film. Kiefer Sutherland from The Lost Boys, Flatliners and 24 fame. Crispin Glover from Back to the Future Fame. Stephen Geoffreys from Horror movie fame, Fright Night, 976-Evil. Also the extraordinary brother to Sean Penn, playing the role of his brother in the movie, Chris Penn. I still can’t believe Chris Penn is gone. He was always a true underrated actor. Also starring the very beautiful and acting excellence, Mary Stuart Masterson. The whole cast works and creates a memorable film that truly does leave a lasting impression. Soon the money is sweet, and the temptation runs wild. Brad wants to join with his father and his gang of other criminal’s. The care free nature of being young, stupid and lost. Brad falls in love with a local girl named Terry and seems to find a purpose in life, when they are together as a couple. Soon, Brad gets the full force of his father's darker nature. Murder comes into the play. The movie is a dark tale of the nature and the nurture aspect of destroying innocence. No guidance, no morality. Brad does not enjoy the darker nature of his father, and decides he has had enough. The musical score give’s an already haunting film, a true impact of a darker nature. The music, and cinematography give it an in-depth feel of dread, and sorrow. The very nature of watching Brad Sr. and his goons take out teenagers, and blow them away without mercy, is truly a disturbing reality. The fact that this movie is true makes it even more horrible to know. The stark reality to senseless death, and betrayal of one’s own blood, is what makes this film worth remembering, and worth recommending. The final showdown between father and son in the kitchen at the end, is a filmed masterpiece moment. I can’t say enough that Penn gives a stunning performance throughout the film. I think the moment that stands out to me, is when the court questions Brad Jr. This moment is acting perfection by Penn. Penn's acting performance of bringing tears, and an all-out built up emotional moment, is truly a priceless, stunning experience that this viewer will never forget. This 1986 crime drama is truly a memorable film that I think more people should see. Christopher Walken captures the true character of Bruce Alfred Johnston Senior, who is the basis of the film. The real Bruce was convicted of six consecutive life terms, one attempted murder and theft. Bruce was the leader of the gang that started in Pennsylvania in the 1960's and was rounded up in 1978 after his son testified against him, which is the basis of the film. The real gang which had a wide network mainly in Chester County, Pennsylvania, but also had ties to Lancaster County, Maryland, and also Delaware. They stole antiques all the way too drugs. They were not a disorganized group. They were not backwoods bumpkins. They all had their role. Gang members had skills at picking locks, cracking safes, disarming security systems. They had lookouts, and police scanners, walkie-talkies. They also would use a ruse by phoning false reports to get the police to look elsewhere. Now the Kiddy Gang as it was known was formed in 1977 which was ran by Bruce Seniors son. Sean Penn plays this character in the movie. The gang formed and created a whole new atmosphere of stealing small time garden tractors, cigarettes and other items that could be stolen and quickly moved. The gang was all under the age of 25 years old, and the youngest being 15 years old. Bruce Junior a.k.a. Brad in the movie, while spending time in prison for petty crimes in the summer of 1977 found out his girlfriend Robin Miller was raped by his dad. This infuriated Bruce Junior and he agreed to testify against his father, he was 20 years old at the time. This would lead to a horrifying crime dealt out by his father, and the gang. Leaving six dead, an investigation, arrest, and a trial, all memorable in the annuals of crime history. This is in all regards a very horrifying true story of one father, and his massacre. There's deep mysteries involved with the subject matter, some even believe there was many more victims. Three of those murdered was, Wayne Sampson 20 years old, Duane Lincoln, 17 years old and James Johnston, 18 years old. These murders are shown, in a vivid, horrifying moment in the film, as they are led into a field, unknowing what is to happen. They disappeared in August 77-78, shot and buried, along the infamous Devils road/Cult house road, along the Northern Delaware, Pennsylvania border in Pennsbury Township, Pennsylvania. Interesting to note, the 2004 film, The Village was filmed in that location. Bruce Alfred Johnston Senior was a true folk lore, type criminal, amazingly, he will always be remembered for his heinous crime, and this movie showcases this part of criminal history. He passed away in August 8, 2002. I have often felt this is an overlooked and underrated movie. Also I feel this is an overlooked and underrated crime. I think it's one of those crimes, that should be remembered for the stark reality, of how violent, it was, and how these members of this gang, family members, went under the radar for so long from 1972, all the way up to the 1980's. Whatever the case, if you go into this wanting to learn the true crime aspect, then it works, if you go into this wanting a great filmed movie, it works. Sean Penn and Christopher Walken are truly stunning and amazing in this film. Another stunning reality to this film is the direction by James Foley. Foley gives true meaning to the form, movie director. Foley has been over looked and underrated in his career. He has had some hits and misses. At Close Range was his second feature as director. He also directed the amazing 1992 film, Glengarry Glen Rose, which Al Pacino was nominated for an Academy Award. Foley is still directing today, most recently for the Series, House of Cards, and as of this writing has been pinned to directing, Fifty Shades Darker, the sequel to Fifty Shades of Grey. This was written by Nicholas Kazan. Kazan is an interesting writer of stories that is able to add that real life feel and setting to the story being display. Kazan also wrote one of my other favorite films that I feel is gravely overlooked, 1998’s Fallen starring Denzel Washington. Like At Close Range, Fallen adds that darkness that is displayed in At Close Range. 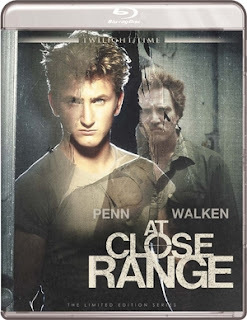 At Close Range adds the real life reality through the writing of the script, penned excellent by Nicholas Kazan. As mentioned I have to give huge shout outs to Juan Ruiz Anchia for the cinematography. This is a stunning example of how to create this reality in film. The tight, dark and, small town, nightmarish criminal nature is weaved together through this clarity of film making. Anchia gave this film a truly stark imagery through the lens of the film camera. The dark shots of heinous acts in the film are flawlessly displayed with a craftsmanship that stands out. He also worked on Glengarry Glen Rose with James Foley. Twilight Time has done this film justice. A Blu-ray that stands out in beautiful picture transfer and High Definition. An amazing 1080p High Definition 2.35:1 for this film seems like a new experience all over again. This has never looked any better. The imagery is utterly fantastic. Crisp, crystal clear. A beautiful transfer. The sound is equally vibrant and pure ear candy. This is a lovely blu-ray and deserves all the accolades if can get. An awesome audio commentary with the director James Foley and also with Film Historian Nick Redman. An utterly fantastic listen. The very important isolated score. As I have mentioned the music gives it such a haunting experience. Patrick Leonard is a true gift to the music world. His songwriting and music producing has left a true stable in the music world. He still is kicking it today, showcasing dynamic music. He has worked most of his career with the music icon and legend, Madonna. He has graced the music world with many collaborations with such gifted and iconic musicians as, Elton John, Michael W. Smith, Rod Stewart, Leonard Cohan, Bryan Adams, Jewel, and many, upon many others. At Close Range was actually his first composing for a film. His music has been used on many soundtracks in the TV and film world. As of this writing over 90 productions. He adds such a darkness to At Close Range that truly leaves, massive imagery in your thoughts, long after the film is over; that is way the music to At Close Range is a pivotal, important reality to this film. Twilight Time did a wonderful job bringing the isolated music score to this special edition Blu-ray. Also the wonderful insert booklet by Film Historian Julia Kirgo, always a fantastic read. She is a true film historian that knows and spreads the love of cinema. These little booklets are very important in my viewpoint. This is a must own product. High class Blu-ray of an excellent film. I highly recommend this film, if you haven't seen it.